Have a real Ferris Wheel at your next event. 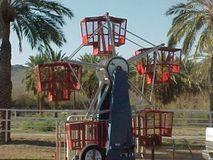 Our 12' kiddie wheel can accommodate kids up to 54" high. Up to 20 at a time means lots of rides for everyone.